The Outlandish Companion is definitely for the lover of all things Outlander. A reader who has never laid eyes on Diana Gabaldon's series will no doubt find interest in the sections that delve into her writing technique and research, past career in academia, and the sprinkling of folk lore. But, I fear, the rest of the 600 page book will be lost on the non-lovers. Thankfully, I am a lover.It has been quite a few years since I have read the first four books: Outlander, Dragonfly in Amber, Voyager, and Drums of Autumn. Part One is a synopsis of each book, whittled down to approximately 15 pages. I was able to get a general grasp of each book before I moved on to the more specifics, the why and the how behind every detail. Yes, you must be a lover to truly appreciate Jamie and Claire's horoscopes.Part Two takes on the characters: Mushrooms, Onions, and Hard Nuts. Who fits into each category? I'll let you find out for yourself. Now maybe the most helpful section for me, the one section that would make me want to keep this book in my library, is the Cast of Characters. There are hundreds, thousands of characters in the Outlander universe and keeping them all straight is a chore. Every character is here in this book, explained in a short paragraph. This section is just perfect for when you are reading Drums of Autumn and don't quite remember how Jared Munro Fraser fits into Jamie's family tree. (He's a cousin.) After Part Two you're going to delve into Family Trees (part three), Glossary and Pronunciation Guide (part four), both interesting and filled with tidbits of information you'd never know and will no doubt find very interesting once you do learn of them.My next favorite section was Six, Research. I loved reading the back and forth between Diana Gabaldon and her many online friends and cohorts. Many give her insight and pose questions that challenges her writing, but in a way that would only make it better. Also, if you've ever considered writing historical fiction this section gives you a good idea about what you're in for...a second home, the library.Part Seven was also a quick interesting read, Where Titles Come From and The Gabaldon Theory of Time Travel. Actually, as an avid reader of all things Outlandish I've never quite understood her theory in regards to time travel. This was a concise tutorial that will surely help me while reading upcoming books.I haven't included every section, this review would be as long as one of Galadon's books if I did! I've only written about the ones I truly enjoyed reading. 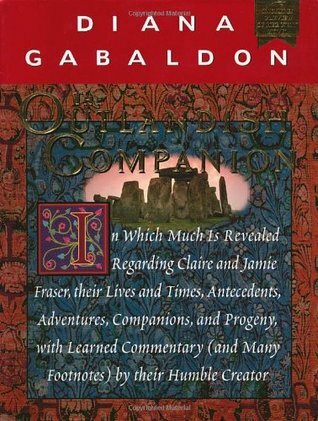 While some this companion wouldn't need to be read over and over again, there is a wealth of information that would be useful for the Outlander lover and fiend. The book is worth it's weight in gold (and gemstones) just for the section on characters. Have an Outlandishly good time reading this, it is well worth the time! I was rather disappointed in this companion book. After reading J.R. Ward's Blackdagger Brotherhood Insiders Guide, I kinda expected this companion to be similar with inside insight into the characters and little tidbits of information not presented in the books. It read more like a dictionary. There are synopses of each book (through book 4 Drums of Autumn). She actually broke down each novel into roughly 15 pages or so. No insight just straight text giving the highlights of each novel. I expected more information here. The chapter on characters was rather interesting but again no new information except the horoscope charts for Jamie and Claire which were impressive but irrelevant IMHO. Sections on Family Trees, glossary/pronunciation guides and websites/online venues, I found pointless and a waste of space (I did not read but quickly skimmed). The chapter on Lallybroch was interesting but again nothing new just bits and pieces pulled from each of the four novels. The frequently asked question section was really interesting. The nerve of some people (readers) is absolutely amazing. Then there are 100 pages of bibliographies - boring and other than an historian, who would read these pages?Regardless of the amount of work that went into this publication by Diana Gabaldon, definitely not worth the $40 price ticket. I love love LOVE the Outlander series, so of course had to have this book. I thought it had many interesting bits, but also a bunch that I didn't care to read (and that's ok! That's what I expected!). I liked FINALLY knowing how to pronounce those Gailic words but WHY oh WHY didn't she have the Foreign Language Glossary in alphabetical order? What a PITA to look up anything.I did like reading her email exchanges with her computer group as she was hashing out ideas -- that was interesting. And I loved her footnotes -- funny. This would be a good gift for someone who loves the series, but not a must-read. This was an enjoyable extra to the Outlander series, though I did skip some sections, such as the list of characters, horological interpretations, Gaelic glossary, etc. It was amusing to see her write about being an author in the early days of the internet, and about her plans for the series when there were only a few books published, and to see how those plans have changed. I read the updated edition, but not all sections were as up to date. One section listed The Fiery Cross as the 2nd to last book, another section mentioned Written in My Own Heart’s Blood. It definitely made me want get a hurry on with the rest of the series so I can discuss it fully with my mom. This book was written as a "companion" to the Outlander series - a book full of fun facts, background details, and stories about "the making of" the series written by Diana Gabaldon. It was written after "Drums of Autumn" (the fourth book in the series). I waited until I had read the first four before reading this - and I would definitely recommend that, as there many "spoilers" included here, as well as a "synopsis" of each of those books. The fact that I would actually read this big, heavy hardback "reference" book cover-to-cover probably says it all. While I am a big fan of the series, I wouldn't say I'm "obsessed". I just love the books. There is definitely something special, something rare about how readers connect with the characters. And I also feel that there is something special and rare about the author herself. Her "stories about the stories" are nearly as good as the stories themselves. I've skimmed a few other similar "companion" books, but found that they were much better used as a tool to refer back to - not something to curl up with and read just for pleasure. Not so with this one. While parts of this book were more interesting to me than others, I found all of it to be very readable, and very enjoyable. This is something that will remain on my bookshelf, as I continue to follow the story of Claire and Jamie Fraser. If you are new to the Outlander universe, this is a gem of a book to pick up. Not only are there detailed summaries of the first books in this remarkable series, the author also has different chapters on where she got her ideas for the characters, her thought process on writing, information about herbal cures, a list of music that would bring Scotland to mind, frequently asked questions, Jamie and Claire's horoscopes, a listing of other books to read once this series reading has been exhausted and many other interesting tidbits.While I did not read all of it, I found the bits I read extremely interesting. I skimmed through some of the other sections and found the parts I picked out to be useful.Recommend this book. I'm kicking myself for not reading this sooner. Until now, I have used the companions as reference books-which they are wonderful for-but I didna realize how much I would love reading all they contain from cover to cover. If you are an Obsessenach like me, I highly recommend you READ these. It was simply delightful from page one. Can't wait to dive into Volume 2. I discovered this book when I was in the middle of the series and found it useful, but I think it could be improved (and hope it will be when Diana completes the series and another such volume might be required).1) It would have been easier to find negotiate the glossaries if the terms had been listed in alphabetical order rather than the order in which they appeared in the book. 2) What was the point of horoscopes for the two main characters? They are fictional characters, after all. I thought this was a terrible waste of space.3) The info on Scottish clans, herbal medicine, family tree of the main characters, etc. were nice side notes to the Gabaldon books. But did we really need Gabaldon's reprinting of reviews and fan mail? I really enjoy Gabaldon's books. I treasure her characters. I admire her imagery. Her fiction speaks to me.But I can't stand her voice! I stopped in the middle of this book because it was ruining the magic for me. I don't want to know how unspectacular her inspiration was. I don't want to know her secrets. Let me remain blissfully uninformed! El culmen perfecto para toda seguidora de la saga Outlander. Información extra historica, de idiomas, lugares, etc, que aparecen durante la historia de Claire & Jamie. Muy entretenido y útil. Excellent a great way to catch up on the series without reading 4K pages. I wish i had this book as a reference when i was reading the first 4 of the series. It gives a synopsis of the first several books, and then delves into some of the "why" questions for character development. If you have already read the books, and wondered how to pronounce all the Gaelic words, this book tells you the phonetic rules for Gaelic, and how the words are used. It also tells you some of the nuances of meaning that aren't obvious in direct translation. The words are arranged by book - so you can use it as sort of a concordance as you are reading. There were sections that i didn't bother to read, such as the astrological charting of the main characters. C'mon, i DONT CARE. I -did- enjoy the sections that discussed how Diana developed her characters early in books so that she could use the details in later stories. Very nice ! Oh, what a fun listen! The Outlandish Companion is a reference based on the first four books of the Outlander series. Ms. Gabaldon describes how she began writing novels, her research approach (fascinating), synopses of books one to four, questions she gets from fans, etc.This audiobook is narrated by Davina Porter, as well as author Diana Gabaldon. Ms. Porter narrates most of the Outlander audiobooks (I believe the novellas have a different narrator) and is wonderfully talented. Ms. Gabaldon's narration is candid and refreshing... listening to her comments felt like listening to a friend and made me like the Outlander series even more. Highly recommended for Outlander fans -- the kindle version is very good but the unabridged audiobook is amazing! The introduction to this book chronicles Gabaldon's journey to becoming a ficion writer (quite a leap, considering her backround in zoology and comic books...yes, you read that right.) It is one of the funniest things I've ever read. She has such a fantastic voice in her writing, I feel as though we're hanging out gabbing over a bottle of wine. You've got to love a girl who writes: "What was the easiest kind of book for me to write? I didn't see the point in making things difficult for myself. After considerable thought, it seemed to me a historical novel was best...if I couldn't make things up, I could look them up." I love her. I enjoyed this book (especially the glossory and pronunciation guide). It was wonderful to get some more background information about the series, what inspired it, why some things happened the way they did, etc. However, I felt that the book was much too long winded and redundant in some places. Overall, a good resource, though. This book helped me a lot while reading the Outlander books. The most important part was without doubt the part where all the characters were specified. But yes, if you are a reader like me, reading this books over a long stretch of time and having problems remembering who is who, then you definitely need this to piece together this immense story. A skim re-read because my interest in genealogy etc is pretty limited. The now-quite-outdated sections on the internet are a little time capsule. Interesting enough in parts, but mostly for reference. It contains a section at the end about the production of the TV series from the sale of the option for the story several times throughout the years to the start of filming in 2014. The part that I enjoyed the most was a collection of letters the author received from readers, some with questions, some with complaints, a lot of them outrageous, and her own responses to these letters. Quaint and picturesque enough to satisfy the incipient obsession I am developing with all things Outlander-ish. I am not usually one to skim, speed-read, or skip entire sections of a book. But for a book in this format, I decided to make an exception. Some die-hard fans of the Outlander series have probably read every bit of this, and there really is a lot of interesting information in here, but not all of the content is worth taking the time to read (e.g. horoscopes). A lot of the information could have been posted on her website or blog. I don't see why she couldn't have made this content available to everyone via the internet, instead of publishing a gigantic book. I would recommend checking this out from your library first (like I did), and then decide whether it's worth purchasing. I enjoyed the "Characters" section, the FAQ's, and the "Controversy" section the most. Overall, it was great seeing the author's perspective on her characters and their actions. I especially appreciated Gabaldon's defense of Frank Randall. I think the hate he gets from some fans in unwarranted. Warning: this does contain spoilers for the first 4 books in the series, so don't pick this up until you've read at least that far. Update review for my 2016 audiobook listen, for the revised/updated 2015 edition of The Outlandish Companion, Volume I: Basically, this is a must-have for Outlander fans, and belongs on your shelf right next to the equally outstanding OCII. I wrote up a reading and listening guide for this volume -- you can view it here at Bookshelf Fantasies.My review of the original edition of The Outlandish Companion (read approx. 2012): For fans of the Outlander series, "The Outlandish Companion" is a must-have. Covering the first four books in the series, TOC is a terrific reference to keep by your side as the cast of characters expands exponentially over the course of the series. TOC includes detailed synopses on the first four books, an alphabetical guide to all characters, Gaelic phrases and pronunciation key, sections on historical accuracy and background, and some very intriguing responses to frequently asked questions. The prologue, in which Diana Gabaldon describes the genesis of Outlander, is a fascinating look at her writing process. All in all, well worth the money for anyone who loves this book series. Overall, an interesting book. I enjoyed Gabaldon's tone, and her anecdotes throughout. I learned some interesting tidbits in regards to the Outlander series, the creation and thought that went into it, as well as her process. Even got a bit of a history lesson, which is always appreciated.My only (personal) complaint is the book took on a professor/researcher tone at times, and that there were a section that was basically the art of research. Truthfully, I understand why this is included, so can't really fault anyone. I just skipped along to the next section.I am very much looking forward to a second companion. This book is a really cool companion book to the Outlander series. There are a lot of glossaries (characters, Gaelic pronunciations/meanings, etc. ), so it reads much faster than you might think, given it's thickness (unless you want to read all that stuff, which if you've been reading the books, you already know about, os it's more a reference than anything).Although I don't recommend reading it till after you've read through "Drums of Autumn". I read it while I was reading "Voyager", and it's got spoilers. She wrote it while she was working on "The Fiery Cross" so there's stuff in there up through Book 4. It's rather funny to think that I bought an 'encyclopedia' for my favorite book series, but well, there it is. If you love the Outlander series, you should own this book as well. It was really helpful in providing insight, helping you keep track of things, and overall just adding fun insight into the series. I'm sure that there will be an updated version coming out soon as this one only includes the books through Drums of Autumn. Still I love everything from Diana and wish I had just a snippet of her creativity. If I could give it a 0 I would. I should not have read this. It makes me like D.G. less. This book, to me, was all about D. and trying to justify something. The books are great with out this. It is NOT a companion. I thought that it would be references and stuff regarding Claire and Jaime. It was all about D.